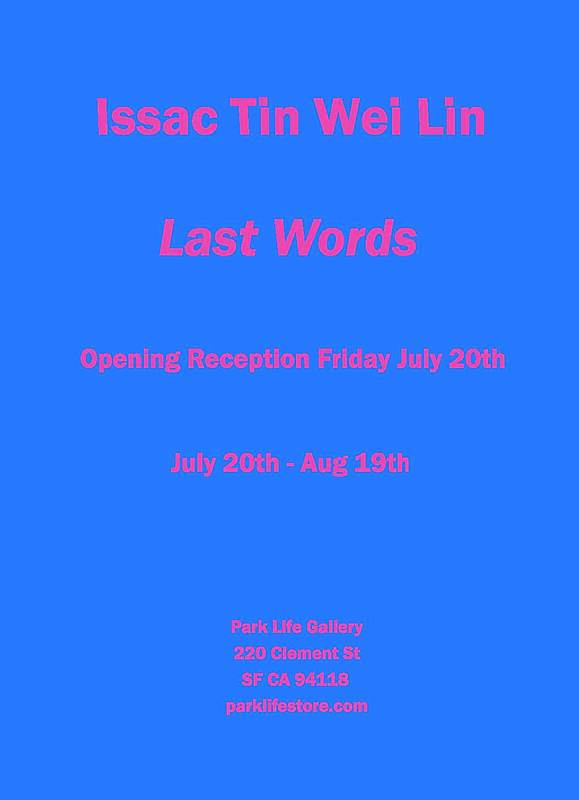 Park Life presents Last Words, new works from Isaac Tin Wei Lin. July 20th to Aug 19th, 2012. Opening Reception Friday July 20th 7 – 9pm. For Last Words Isaac Lin will be exhibiting a new body of paintings and drawings in the Gallery. Last Words refers to the reality of existence where all things run their course and come to an end. The works in the show represent wordless, final statements and expressions of the dichotomies and life that occur between the beginnings and the endings. Lin is as influenced by his Chinese heritage (he is the first of his family to be born in the United States) as he is by American street and popular culture. His works, ranging from calligraphic-like pattern, musical notation, cartoon cut-outs, and bright color, span traditional categories of painting, printmaking, assemblage, collage, sculpture and installation. Philadelphia artist Isaac Tin Wei Lin makes prints, sculptures, and installations that explode with layers of calligraphy, cartoons, color, and pattern. Lin graduated with a BFA in Painting from Rhode Island School of Design and has an MFA from California College of the Arts. He is an alumnus of Philadelphia’s artist collective Space 1026.